Editorial: Treating the patient or the disease? Significance of personal plaque control for therapy and prevention of periodontal disease - do established concepts still reflect current knowledge? Establishment of effective personal oral hygiene is a widely accepted prerequisite for therapy andprevention of periodontal disease. Long-term clinical studies have, however, to date not been ableto deliver definitive proof of a preventive periodontal effect of good oral hygiene beyond gingivitisreduction. Data derived from more recent studies have fundamentally challenged the validity of thecentral role of oral hygiene in periodontal prevention. Contrary to former concepts, the driving forcebehind the development of pro-inflammatory dental plaques is not a lack of oral hygiene, but rathera malfunction or overreaction of the oral immune system. Good oral hygiene can only, to a very lim-ited extent, alleviate the effects of such immunological deficiencies on the integrity of the periodon-tium, and it is therefore essential in periodontal patients to supplement it with regularly performedprofessional preventive measures. Saetervold, Heidi / Bruseth, Ane Marthe / Orstavik, Dag / Preus, Hans R.
The endo-perio lesion may be defined as an infrabony, marginal pocket communicating with an inflam-mation of pulpal origin. In clinical practice, a separate endodontic and periodontal diagnosis is made,whereas treatment outcome eventually confirms the diagnosis of an endo-perio lesion. The treatmentprognosis of such teeth is poorly understood, due to diagnostic uncertainties. The purpose of this studywas to assess the 2-year survival of teeth with an endo-perio diagnosis. A total of 3,700 cases werereviewed. Inclusion criteria for the test group were teeth that had been endodontically treated for apulpal/apical condition and showed severe periodontal involvement with pocket depth >=6 mmand/or furcation involvement. Exclusion criteria were file or root fracture, accidental perforation to theperiodontium during an endodontic procedure, and internal or external root resorption. 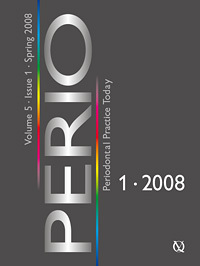 One hundredteeth that had been endodontically treated due to pulp necrosis, pulpitis and/or apical periodontitiswithout any periodontal involvement were used as a control group. One hundred and thirty-four teethcomplied with the inclusion criteria. The results showed that 20/134 (15%) of teeth in the test grouphad been extracted after 1 year and 25/134 (19%) after 2 years. The extraction rate was significantlyhigher for teeth with chronic apical periodontitis (27%), as compared with teeth without an apicallesion (10%). None of the control teeth had been extracted after 2 years. Periodontally involved teethare at high risk of being extracted after endodontic therapy, and the risk increases with increasing sever-ity of the endodontic diagnosis. Rawal, Swati Y. / Rawal, Yeshwant B. / Anderson, Kenneth Mark / Bland, Paul S. / Stein, Sidney H.
Plasma cell gingivitis (PCG) is characterised by a heavy plasma cell infiltration into the gingival con-nective tissue. It has been associated with the use of flavouring agents like cinnamon and mint incandy, chewing gum and herbal toothpastes. PCG secondary to khat (Catha edulis) chewing has recently been recognised. Khat is a psycho-stimulating herb that is cultivated and used in East Africaand the Arabian Peninsula. It produces a stimulating and euphoric effect on its users. Plasma cell gingivitis in a khat user is presented. A 40-year-old male presented with a generalised diffuse erythema and painful gingival enlarge-ment. He also reported bleeding upon eating and brushing. Generalised periodontal pocketing andmoderate to severe attachment loss were detected on probing. Radiographs revealed generalisedalveolar bone loss. A gingival biopsy revealed a dense infiltrate of plasma cells in the connective tissue. A histopathological diagnosis of plasma cell gingivitis was made. It was revealed that the patient was a Yemeni immigrant and a habitual khat chewer for the last 10 years. A marked improve-ment in gingival health was noted a few weeks following cessation of the khat chewing habit.Gingival erythema and swelling further diminished following initiation of oral prophylaxis.A diagnosis of plasma cell gingivitis associated with khat use was made. A worldwide populationof immigrants habituated to khat chewing could potentially increase the incidence of plasma cell gingivitis. Recognition of this habit and its implications on periodontal health is emphasised. Treatment of intrabony periodontal defects with an enamel matrix derivative (EMD) promotes peri-odontal regeneration, i.e. regeneration of cementum, desmodontium and bone, resulting in significantreduction of probing depth and also in clinical attachment gain. There is, however, at present only lim-ited information available on long-term results of this regenerative form of therapy. The aim of thepresent study was to evaluate clinical results 10 years after treatment of intrabony defects with theenamel matrix derivative Emdogain®(Straumann, BaseI, Switzerland). Twenty-one patients who eachhad one intrabony defect with a probing depth >=6 mm were treated with enamel matrix proteins. Thefollowing clinical parameters were investigated before treatment as well as 1 year and 10 years aftertreatment: probing depth (PD), gingival recession (GR) and clinical attachment level (CAL). After oneyear, the average probing depth PD had been reduced from 8.1 ±1.7 mm to 3.5 ±1.0 mm (p < 0.0001). After 10 years, PD was 4.0 ±1.2 mm, i.e. significantly increased in comparison with the1-year results (p > 0.05). Compared with baseline there was, however, still a significant improvementin probing depth (p < 0.0001). After 1 year, GR had increased from 1.9 ±1.5 mm to 3.2 ±1.9 mm (p < 0.001). After ten years, GR was 2.8 ±1.5 mm. At this point in time, GR showed significant im-provement compared with the 1-year results, but was still significantly greater than at baseline (p < 0.001). Average CAL changed from 10.0 ±2.3 mm to 6.8 ±2.3 mm (p < 0.0001) after 1 year,and subsequently to 7.0 ±1.9 mm after 10 years. The change in CAL between 1 and 10 years was notstatistically significant. The results suggest that clinical improvements that have been achieved aftertreatment with enamel matrix proteins can be maintained over a period of 10 years. Aim:The aim of the present study was to investigate the association between periodontal disease andacute myocardial infarction (AMI). Study design: A total number of 120 patients were selected for the study. Sixty patients who were ex-amined immediately following an episode of myocardial infarction were selected as the test group and60 patients suffering from chronic coronary heart disease were selected as the control group for thestudy. The study was conducted with the help of a medical history, periodontal examination and analy-sis of enzyme profile of the patient. Results:Results of multiple logistic regression analysis, without adjusting for confounding factors,showed that plaque index (PI) >=2, periodontal disease index (PDI) >=4 and low density lipoproteinswere associated with AMI. Former smokers showed a significantly lower risk for AMI. After adjustingfor age, current smoking, diabetes, hypertension, low density lipoproteins and high density lipopro-teins, the results showed that PI >=2 and PDI >=4 were not significantly associated with AMI. Conclusion:PI>=2 and PDI >=4 showed a significantly positive association with AMI, when the con-founding factors were not adjusted. However, once the confounding factors were adjusted, PI >=2 andPDI>=4 showed no association. This shows that risk factors such as smoking and hyperlipidemia havea more profound association with AMI than periodontal disease.